The first time I heard about beef cutlets was when I started dating my boyfriend (now husband), Roby, in college. He would always tell me about these cutlets that his mom would make him and I’d have no clue what he was talking about. What in the world is a cutlet? Well, in Indian cuisine, a cutlet can be made with either meat or potatoes or both. I grew up in a north Indian family and we called a “cutlet” something else: “tikki.” We usually made “aloo tikki” or “potato cutlets” at home. I didn’t realize that my husband, who is south Indian, and I grew up eating almost the same thing until I finally tried my first beef cutlet. I remember telling him, ‘hey! this is a tikki… but made with beef!’ You may know cutlets and tikkis as “croquettes.” Isn’t it interesting how we’re all eating variations of the same thing around the world and yet calling it by a different name? Food for thought. Literally. The cutlets that Roby grew up eating are slightly different than my recipe here – because my cutlets are gluten-free. Roby says they’re just as good though! Beef cutlets are typically made with white potatoes, coated with breadcrumbs and deep fried. 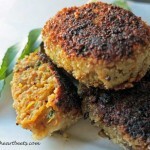 In my version, I use sweet potatoes and almond flour – then I shallow fry the cutlets in ghee. I’ll sometimes use potatoes instead of sweet potatoes – it’s really up to you. These cutlets take a little time to prep. The steps are easy, but be patient. First, you’re going to cook the meat with all the spices and then mince the meat. I did this in my nutribullet but if you have a food processor then you can use that. Add the minced meat to the onion mixture. It should look a little something like this. Add the boiled sweet potatoes and then mix it all up. Make pretty patties and then put them in the fridge. When you make this dish with white potatoes, they hold together pretty well but when you use sweet potatoes, you really need to put them in the fridge so they’ll become firm. I left mine overnight and the next day, they were very firm which made it much easier to gently dip them in the egg mixture and then the almond flour. After shallow frying these guys in a cast iron skillet, they’ll look deliciously golden. When you eat them, you’ll see that the beef just sort of melts in your mouth and all that remains is the spicy kick it leaves behind. 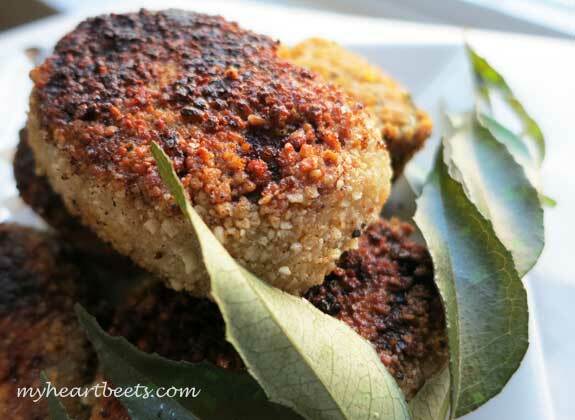 If you enjoy these cutlets, be sure to check out my recipe for Tuna Croquettes too! Boil the sweet potatoes. Peel and mash them and then keep aside. In a pan, stir-fry the ground beef with turmeric, meat masala, kashmiri chilli powder (or cayenne), freshly ground black pepper, and salt. Add water and cook on medium heat for 10 minutes. If there is any remaining water, cook on low heat until it all evaporates. 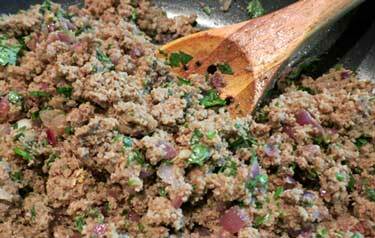 When meat is cool, put it in a food processor or magic bullet to mince the meat. Heat a couple tablespoons of oil or ghee in a pan and add the onion and serrano peppers. After a couple minutes, add ginger and garlic. Stir until the onion turns brown. Add chopped cilantro leaves. Add the minced beef to the onion mixture and stir it all together. Then add the mashed sweet potatoes to the beef, stir and let the mixture cool down. Dip the patties into the egg and then gently place into the almond meal. Shallow fry the cutlets in a cast iron skillet until golden. Use a fork to gently flip them over. Serve with chutney, ketchup, whatever you like! I just saw you are living in Morgantown, WV. I am from Morgantown and my parents still live there. I have been reading your recipes and find them very fitting for my Primal lifestyle. And I love Indian food. I am looking forward to trying your curried eggs later this week and keeping an eye on your blog. These look amazing! Do you think it would be possible to make without eggs? I would love to try them, but our family had an egg allergy. Hi Sarah! You can definitely make this without eggs. The only reason I used the whisked egg was to get the almond flour to stick to the patties. If you’re not worried about fat content, I would try brushing some ghee onto the patties before dipping them in almond flour. You could also try using almond milk mixed with a bit of oil. I hope this helps! Hi, Anne! I agree, this dish is a great way to introduce yourself to Indian cuisine. Hi, regarding your beef cutlets, why do you process it when it is already ground mince you are using ? I a lying in bed going through all your recipes and want to,make them all, right now. Would the recipe work with coconut flour instead of almond flour? Lois, I haven’t tried using coconut flour so I’m not sure. If you try, let us know how it turns out! VERY yummy! LOVED all of the flavors,especially the fresh made & ground meat masala. I will be using it or many dishes. My only issue with the cutlets Ashley: I made the patties and refrigerated them overnight…but they still fell apart while & after frying…. Wondering if there is a better way…I really do not want to go the white potato route but will if I MUST. LOL Any suggestions?? OTher than that, this recipe was perfect, as always with your recipes. Hi Lisa! Glad you liked the flavors! As for the patties falling apart – my guess is that there’s too much liquid – either from the sweet potatoes or from the beef. If the patties don’t look like they’re sticking together, I’d suggest adding tapioca or arrowroot to the mixture to help thicken it up. Also, maybe try reducing the heat when shallow frying. Let me know if this works – otherwise, I’ll try the recipe again to see if I can troubleshoot. Hope this helps! I haven’t made these cutlets yet but will be making them this weekend. 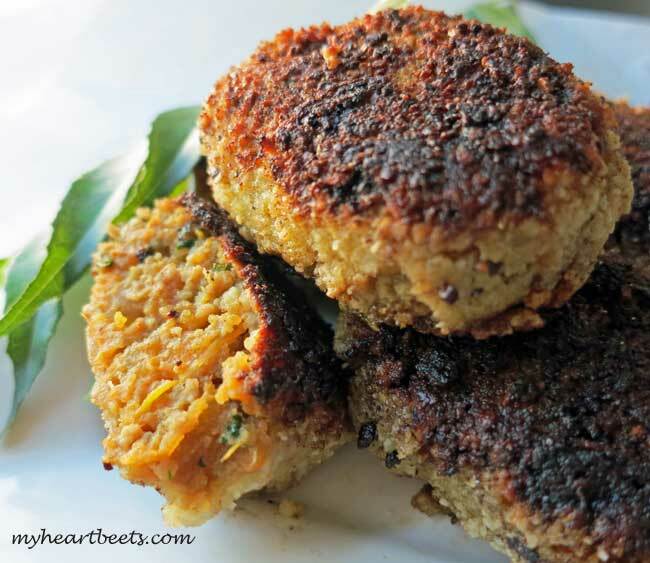 I have made your tuna croquettes and they were absolutely delicious……my husband is from South India and he loved them. 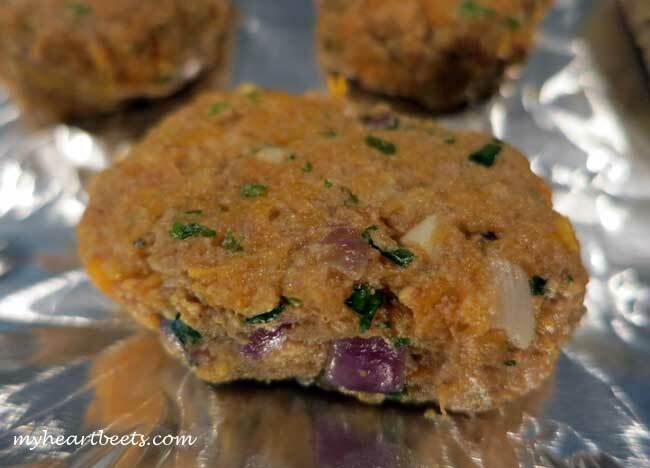 I was thinking with the beef cutlets could you bake the sweet potato instead of boiling it……as the sweet potato in the tuna croquettes was baked in the oven and then mashed…..maybe this would help hold the beef cutlets together better. Isn’t eating beef anything to an Indian sort of the same as drinking Sacramental wine coolers to an American Christian? Rex, some religious communities in India (like Christians) are okay with eating beef – something that not many people know.